While returning from the local market with some vegetables, cheese and sausages, we noticed a notice promoting an event in a nearby village. 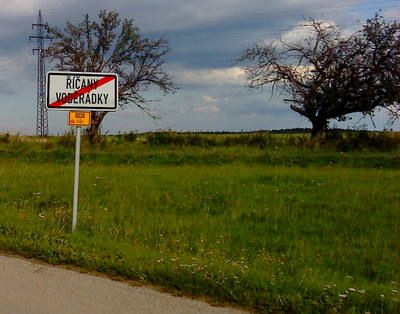 Since we did not have any fixed plans for the afternoon and because I realized we haven't really visited Voděrádky since we moved, there was nothing to think about. It turned out to be the classical fairytale-popculture-quiz. There were about fifteen standpoints where local grownups and teenagers dressed as fairytale characters were giving questions or asked us to perform something based on popular czech fairytales before we could move on to another standpoint. We do not have a TV so some of it was quite difficult :-) Joining another group really helped us to get through. This is the last stage. The tent on the left contained the treasure, while the rightmost one contained tombola prizes. We were lucky enough to win a musical toy for the little sister there. The end. 50 minutes to walk back home.